Conversational Norwegian includes the first 16 lessons from the Pimsleur Comprehensive Norwegian Level I program. This Conversational program contains 8 hours of interactive audio-only instruction, effective language learning with real-life spoken practice sessions. The Pimsleur Method provides the most effective language-learning program ever developed. The Pimsleur Method gives you quick command of Norwegian structure without tedious drills. Learning to speak Norwegian can actually be enjoyable and rewarding. The key reason most people struggle with new languages is that they aren't given proper instruction, only bits and pieces of a language. Other language programs sell only these pieces -- dictionaries; grammar books and instructions; lists of hundreds or thousands words and definitions; audios containing useless drills. They leave it to you to assemble these pieces as you try to speak. Pimsleur enables you to spend your time learning to speak the language rather than just studying its parts. When you were learning English, could you speak before you knew how to conjugate verbs? Of course you could. That learning process is what Pimsleur replicates. Pimsleur presents the whole language as one integrated piece so you can succeed. 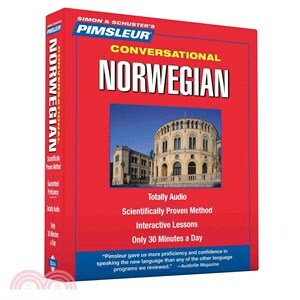 Conversational Norwegian includes the 10 lessons from Pimsleur's Basic Norwegian plus an additional 6 lessons. The 16 lessons in Conversational Norwegian are the same first 16 lessons in the Pimsleur Comprehensive Norwegian Level 1.